Ilagan, Isabela— Eljay Marco Vista drew inspiration from his father’s keen interest in combat sports and his first experience in joining an international competition last year. 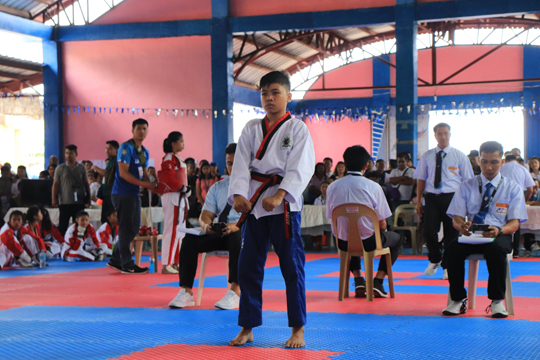 The 12-year-old Vista did his routines well to get the highest score and claim the 15-under boys’ poomsae taekwondo gold in the cadet male division at the start of the Luzon Leg of the 2019 Philippine National Youth Games-Batang Pinoy at the San Felipe Covered Court here yesterday. “Sobrang saya. Kasi matagal ko nang pinaghahandaan ang mga national competitions,” said Vista after he won the first gold medal at stake in the games. Vista, according to his coach Lacey Andres, completed his routines under the formation (taeguk) 8 stance with rhythm and fluidity as he was able to upset Palarong Pambansa champion Kacey Canlas of Olongapo City. The series of formations, which included a walking stance, a front stance, a low block and five other combinations that needed lots of focus, earned Vista the highest average score of 7.67 points. Canlas, who pocketed the category 2 gold last year in the 2018 Palarong Pambansa, settled for the silver medal with 7.6 points, while Wriley Canao of Baguio City was third with 7.465. “Hindi ko po inexpect na maka-gold ako. Kasi may kalaban po ako sa Palarong Pambansa at naka-gold siya last year,” said Vista, an eighth grader at the Ilagan South Central School. The young Vista, who got into the sport at age four, inspired his father, lawyer Oriel Vista, to get a black belt. The elder Oriel was the last to earn a blackbelt in his family after Eljay and his elder brother Carl Gian earned their promotion two years earlier. Oriel and his son joined a World Cultural meet last year in Korea. Eljay ended up with silver medals in the poomsae and the sparring meets, while Oriel took home a gold in the masters category. Meanwhile, Ian Matthew Corton of Quezon City and Aesha Kiara Oglayon of Baguio City claimed the poomsae golds in the junior boys and cadet girls, respectively. Corton tallied 8.105 score from the judges, with King Nash Alcairo of Quezon Province scoring 8.04 and Emmanuel Christopher Austria of Naga City having 7.95 for second and third, respectively. Oglayon got 7.82 to outpoint Khyla Kreanzzel Guinto of Baguio with 7.765 and Antonette Medallada of Paranque with 7.65. Swimming competitions, which offer 14 golds in its opening day, was reset for Tuesday, as organizers made adjustment over the quality of the water of the pool that they will use at the old Isabela Sports Complex site. In softball, Manila won over Sta. Maria, Bulacan, 6-4, while Tanuan turned back Baguio City, 11-0. In beach volleyball, Pangasinan won over Mandaluyong, 21-18, 21-15, in the opener of the men’s action. Olongapo waylaid Ilagan, 21-1, 21-4, to earn a share of the lead. In girls’ volleyball, Pangasinan prevailed over Mandaluyong, 25-7, 25-8, while Angeles edged Sta. Rosa, 25-21, 25-12; Bataan turned back Muntinlupa, 25-13, 25-18; and Mariveles downed Candon, 25-7, 25-12. In boys’ chess, Mark Bacojo of Dasmarinas City moved ahead with 4 points after he stopped Freddie Casabueno of Muntinlupa after four rounds. Jan Labog of Nueva Vizcaya was close behind after he outplayed Jess Masibag of San Jose del Monte. In basketball, Pasig took the early lead with Mariveles and Polangui following a 52-51 triumph over Mandaluyong. Mariveles won over Pasig, 77-26, while Polangui edged Guinobatan, 71-50. All eyes will be on national juniors’ record holder Micaela Jasmine Moldeh of Paranaque as she seeks at least five golds in swimming. Mojdeh, who holds the national marks in 100m and 200m butterfly, will take part in the girls’ 200m and 400m individual medley. She will try to claim the 100m and 50m butterfly golds on Wednesday and the 200m butterfly crown on Thursday.